Thanks in part to the work of the Consumer Financial Protection Bureau, over the past few years, it’s become a lot easier for consumers to get a copy of their credit score for free. In fact, while just a few years ago, there was no way to get your credit score without paying for it, by the end of this year, more than half of all Americans should be able to get their credit score for free, as more banks begin offering this service as a complimentary benefit to their customers. Is your bank one of them? Read on to see who’s on the list. Alliant Credit Union Alliant Credit Union provides its members a free VantageScore, viewable in their online banking account. The score is updated quarterly. Ally Financial Ally began offering its auto finance customers free access to their FICO score as part of a pilot program in February with plans for a full launch this summer. The FICO scores, which are from TransUnion, are available to customers who use Ally Auto Online Services or the Ally Auto Mobile Pay app. American Express Beginning in late 2015, American Express has provided personal and consumer charge card holders free access to their FICO 8 score, based on data from Experian. Cardmembers can view their score, as well as two factors that are most affecting their score, when they log into their AmericanExpress.com account online. Bank of America As of early 2016, select consumer credit card customers are eligible to view their credit score and history for free through their online account. Barclaycard Barclaycard was one of the first banks to begin offering free credit scores, providing free FICO score access to its cardmembers on an opt-in basis back in November 2013. In addition to your FICO score, Barclaycard will also show you up to 2 factors affecting your score and a history chart tracking your score. Customers can also elect to receive email alerts when their score changes. Updates can be quite sporadic, however. Capital One Offers holders of its consumer credit cards access to its free credit monitoring tool called “Credit Tracker.” The service provides access to your TransUnion Educational Score (not your true FICO score), a credit simulator to show you how your actions can affect your score, and email alerts if your TransUnion credit report changes. Chase Chase is in the process of rolling out free monthly FICO score access, along with a new EMV-chipped card, to its 10 million Chase Slate cardholders throughout 2015. Chase Slate customers who haven’t yet received credit score access can contact customer service to be immediately upgraded. Once all Slate customers have been upgraded, Chase is expected to roll out the program to its Freedom and Sapphire cardholders. Citi Consumers with Citi-branded credit cards can access their free FICO score, based on their Equifax credit report, when they log into their online accounts. Commerce Bank Beginning just last month, Commerce Bank is providing free FICO credit scores to its consumer credit card holders, along with the top two factors impacting their score, on their monthly statements. Customers must be the sole owner of their account–joint accounts are not eligible for the program. Digital Credit Union DCU members can sign up to receive a free Equifax FICO score, updated monthly. Members can view their score in their Online Banking account. Discover Discover was the first major credit card issuer to provide free credit scores. Discover cardmembers can view their free FICO scores from TransUnion on their monthly statements, provided either through the mail or online. First National Bank of Omaha Along with Barclaycard, FNBO was one of the first to offer free FICO score access to its cardmembers back in late 2013. FNBO cardmembers can access their FICO score by logging into their FNBO online account. Pentagon Federal Credit Union Pentagon Federal Credit Union offers a free FICO NextGen score, pulled once per quarter, to its members that is available to view when members log into their account online. Scores are available to PenFed members with an active checking account, installment loan, or a revolving line of credit, such as a credit card. Sallie Mae Beginning in June 2014, Sallie Mae started offering student borrowers free access to their FICO scores. Eligible private student loan customers receive their FICO scores quarterly, along with the personalized key factors influencing their score. State Employees’ Credit Union SECU members who have an active lending relationship can view their FICO score from their online account. The score is retrieved from Equifax on a quarterly basis. Synchrony Bank Synchrony Bank is the issuer of the Walmart credit card, which provides free monthly FICO credit scores to its cardmembers when they enroll to receive electronic statements. US Bank Since 2011, US Bank offered a free Experian Plus (FAKO) score online to its retail credit card customers. Just within the past month, however, they have transitioned to providing a free service called CreditView instead. CreditView provides a credit score, plus an online simulator to show how financial choices may affect your score. CreditView is available to any US Bank customer who uses online banking. USAA USAA provides free online Experian VantageScores to all its members. Once a year, it also provides a credit report and factors affecting credit. Wells Fargo Wells Fargo provides free FICO score access for eligible customers who have a Wells Fargo consumer credit card with a FICO score on record. Currently, it is providing the service exclusively through its mobile banking platform. Customers can access their FICO score either through the free Wells Fargo Mobile Banking app available from your device’s app store or by visiting wellsfargo.com on your mobile phone’s browser. More information on the program can be found here. Also note: Your bank/lender isn’t the only way to get a free credit score. See this post which describes more ways to get your credit report or score for free. 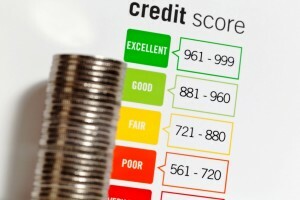 What’s the difference between a FICO score and a VantageScore? A FICO score is a credit score that was generated by Fair Isaac Corporation, which dominates the credit scoring market. FICO scores are the gold standard of the loan industry, with over 90% of lending decisions–from buying a home or car to opening a credit card–relying on some form of the FICO score. A VantageScore is the name of a credit score created by the three major credit bureaus– Equifax, Experian and TransUnion–as an attempt to compete with the FICO score produced by Fair Isaac. While VantageScore claims that its model was used by over 2,000 lenders and 6 of the 10 largest banks in 2014, it remains undeniable that FICO scores are used much more widely and as a consequence, generally more valuable to have. Did we miss any banks or other lenders? Let us know in the comments.